Galician adherent of the Haskalah, and teacher of philosophy at the rabbinical seminary of Jitomir, Russia; born near Brody, Galicia, 1790; died at Jitomir July 29, 1880. As a youth he was the pupil of Nachman Krochmal. He left Brody for Odessa, where, in the early thirties of the nineteenth century, he was appointed private secretary and tutor in the household of Baron Joseph Yozel Günzburg, settling in Kamenetz-Podolsk. Upon the opening of the rabbinical seminary at Jitomir, Suchostaver was called to that city; and he remained identified with the institution until it was closed (1873). 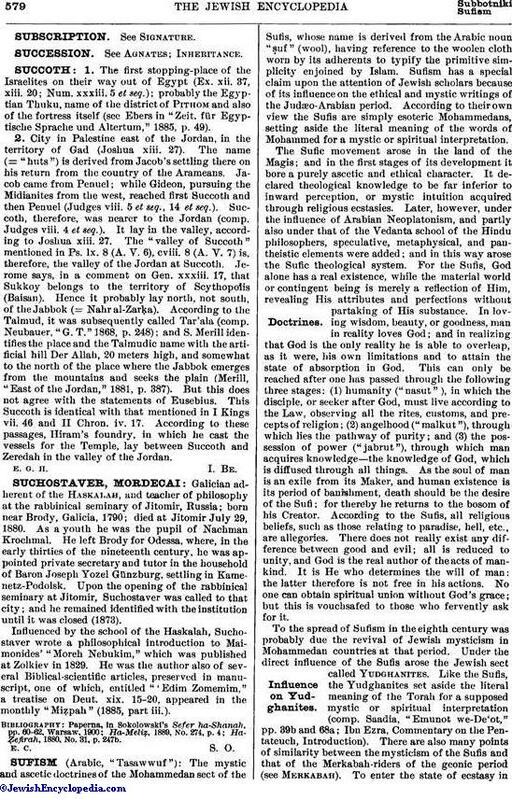 Influenced by the school of the Haskalah, Suchostaver wrote a philosophical introduction to Maimonides' "Moreh Nebukim," which was published at Zolkiev in 1829. He was the author also of several Biblical-scientific articles, preserved in manuscript, one of which, entitled "'Edim Zomemim," a treatise on Deut. xix. 15-20, appeared in the monthly "Miẓpah" (1885, part iii.). Ha-Ẓefirah, 1880, No. 31, p. 247b.